Motocross des Nations: Sanity desired, Money needed, National Pride overblown. Defending Champion Germany has home field advantage, but the injured Marcus Schiffer (left) won't be on the team with Nagl and Roczen. He will be replaced by Dennis Ulrich. Often considered as the ultimate motocross race, there are many hidden secrets behind the MXDN. It isn’t as “ultimate” as its seems. It is a great spectacle, but here are some things to think about. Laporte, Hansen, O'Mara and Sun in 1981. Ryan Villopoto: Ryan is taking a lot of flak for electing not to race the 2013 MXDN—opting instead to have some screws removed surgically so that he’ll be ready for the Monster Cup in October. Good for Ryan. He has to do what’s best for him, and he joins a long line of American riders who didn’t want to fly to Europe to race the MXDN at the end of a long season. The names include some of the biggest stars in American motocross history. And, on more than one occasion Team USA decided not to send a team at all. 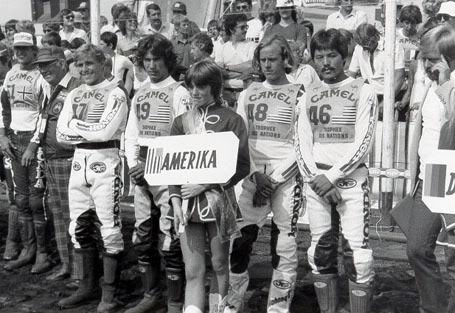 In fact, in 1981, after Team USA skipped the event for two years, MXA raised the money to field the team—and we couldn’t get any of the established stars to go. We asked all of the big names and they all said “No.” In the end, Roger DeCoster came to our rescue and sent the whole Honda team (Sun, O’Mara, LaPorte and Hansen). So, if Ryan wants to stay home, he’s in good company. Politics: Team managers and federation don’t like some riders—and if they don’t like someone, or they like someone better, they often skip worthy riders. Marvin Musquin was not selected for the 2013 French team. They had skippedover Christophe Pourcel in the past. Or, if you go farther back in time, many AMA 125 National Champions were ignored so that old-line heroes could take their spot (think of two-time 125 National Champion Micky Dymond never being on the team). And several years ago, Jeffrey Herlings refused to race the MXDN because he didn't think the other Dutch riders were any good. Matt Moss — no show. Conflicts: The biggest conflict of the 2013 MXDN is that it is held very late in the season (September 29), which is why Ryan Villopoto doesn’t want to go. The late MXDN date would mean that his leg wouldn’t have time to heal before the Monster Cup...and the Monster Cup has been very good to his bank account. Additionally, the Australian Supercross series is held during the same time period, and although the Aussie aren’t racing on September 29, it would be tough to shift gears from Supercross to outdoors and fly away between rounds. 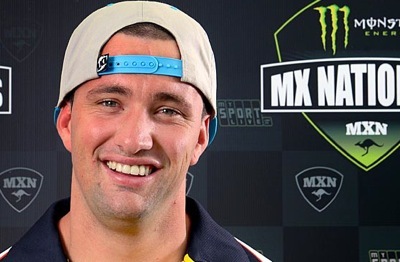 Thus, the best rider in Oz right now, Matt Moss, doesn’t want to go to the MXDN. Best of the best: The idea of the 40 best motocross riders in the world on the track at the same time is very appealing, but it is not true. Each team is made up of the three best riders from their country. You have the three best Belgians counterpointed by the three best Greeks (the lap time difference between them is a staggering 30 seconds—which means that in a 17-lap moto the Greeks would be lapped four times). And even though the Greek, Mongolian, Israel and other slow teams are weeded out before the finals—some slugs still make the field. Thus, the starting gate at the MXDN doesn’t have the 40 best riders in the world—it has 15 of the best riders in the world, 15 riders who are decent journeymen and 10 riders who wouldn’t win a local race in SoCal. Many of the fastest riders in the world are sitting at home, while guys they could easily beat are racing. 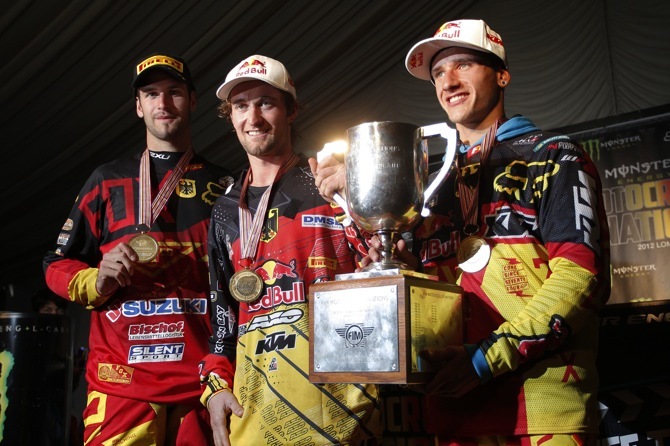 Costs: For the German team the 2013 MXDN will be cheap—because the race is in Germany. One of the reasons that Matt Moss doesn’t want to race for Team Australia in 2013 is that he had to paid his 2012 expenses out of his own pocket. Foreign riders racing in the USA are often skipped because the federation doesn’t want to pay their expense. Dean Wilson wanted to be on the British team again in 2013, he is Scottish by birth, but he asked for three airline tickets. He will be sitting at home of September 29. Plus, most national motorcycle federation don’t have a lot of spare cash. Think about the cost of sending three riders, mechanics, bikes and team personnel from China, Iceland, Japan, Mongolia, New Zealand, South Africa, Thailand or Venezuela. The kicker is that some of these team will be bounced after timed practice, some will end up in the morning support race and none of them will be in the actual Motocross des Nations.